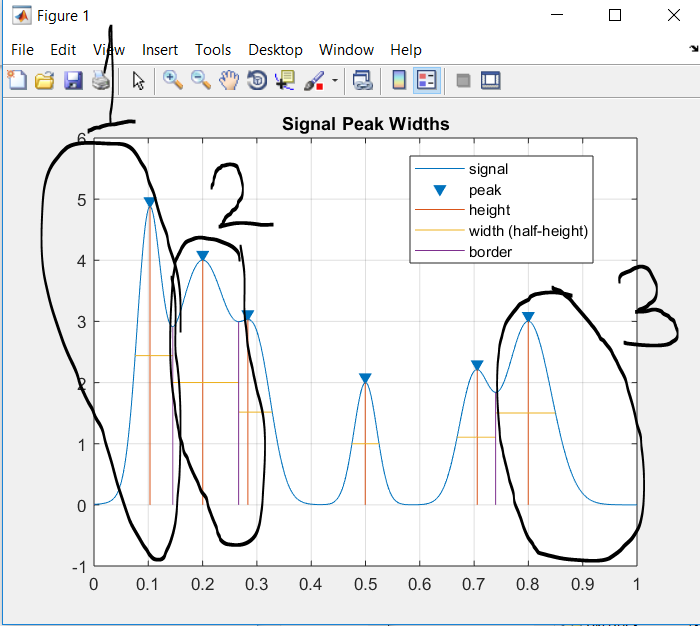 I am trying to figure out how to cut out the specific segment of the signal where I draw the border using findpeaks function. I want to cut the segment of the border into 3 segment. The method I am thinking is find the X value corresponding the Y value, which is not an effective way to do it. You have to search the ‘Axes.Children’ result manually to find the ‘(Border)’ elements. There appears to be no way to get them automatically, or even to specifically search for a ‘Line (Border)’ or ‘Border’ entry in the ‘Kids’ variable. (There may be a way, but it would take more patience than I have tonight to find it. I’ve tried every cell and structure addressing approach I can think of or can find in the documentation, including using strcmp and related functions, and couldn’t get a good result.) It would be very nice if this was more straightforward. 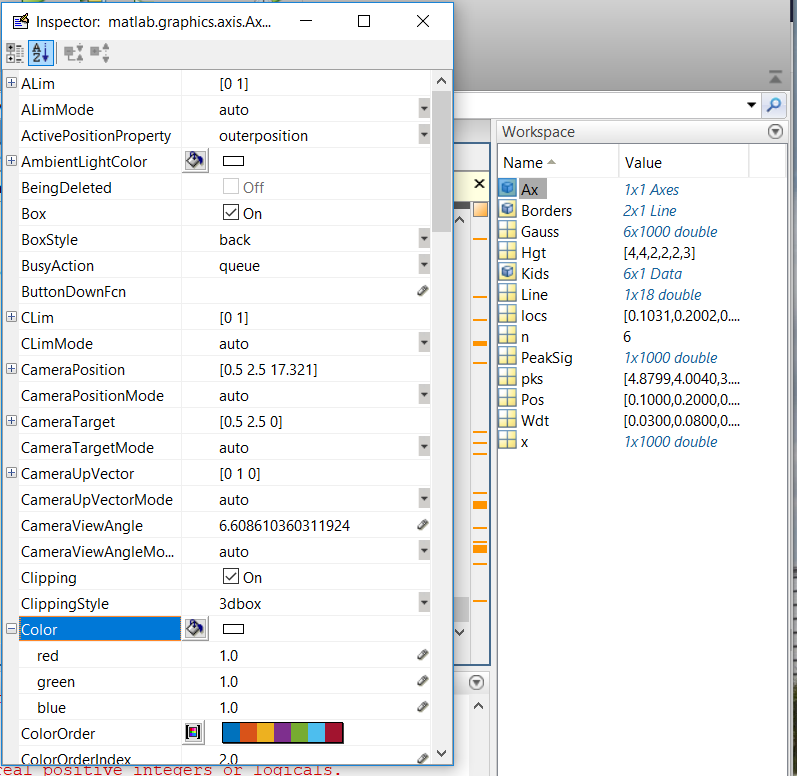 Do you know what is the name of the documentation in matlab to read more information on using "Axes", "Border"? I run the code, it give me some "Ax", "Borders", "Kids" information in my Workspace", but I have no idea how to read it. The ‘Kids’ variable is simply ‘Ax.Children’, the ‘Children’ field of the ‘Ax’structure. The ‘Line’ variable has the x-axis coordinates of the ‘Border’ lines. I can’t specifically access the ‘Border’ Line objects by name, so I need to simply refer to them by subscript reference. See the documentation on Axes Properties (link) and Access Data in a Structure Array (link). The value of the peaks returned is now ‘-Pks’, ‘Locs’ is correct as returned. I still couldn't get the meaning. are the ‘borders’ you want. Yes, correct. I tried the code below and check with the plotted graph, the "Locs" is the width value. Can I know the reason behind? "-PeakSig" mean the opposite/negative/reflect side of the original "PeakSig"? 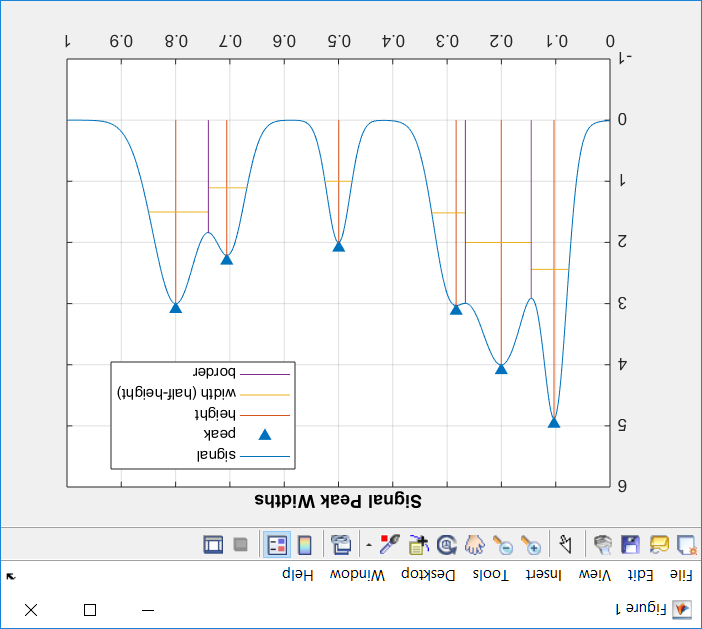 Taking the negative of ‘PeakSig’ inverts it, so the peaks are valleys amd the valleys are peaks. 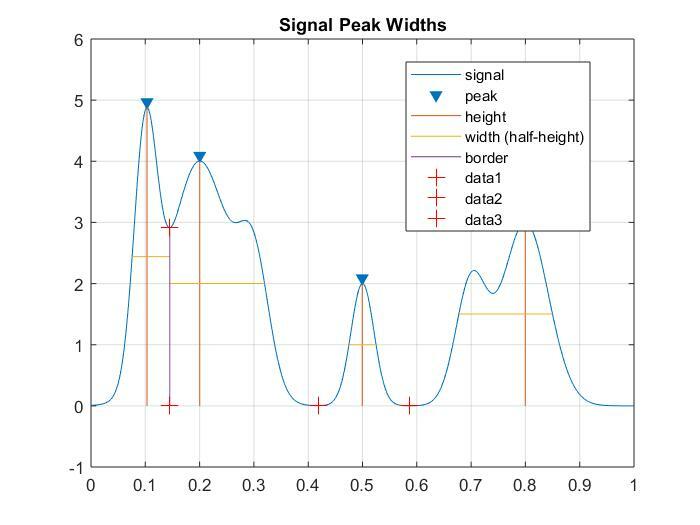 The findpeaks function then does what it si designed to do, and finds the peaks of the inverted (negated) signal. Thanks. Is inverted means Up side down? 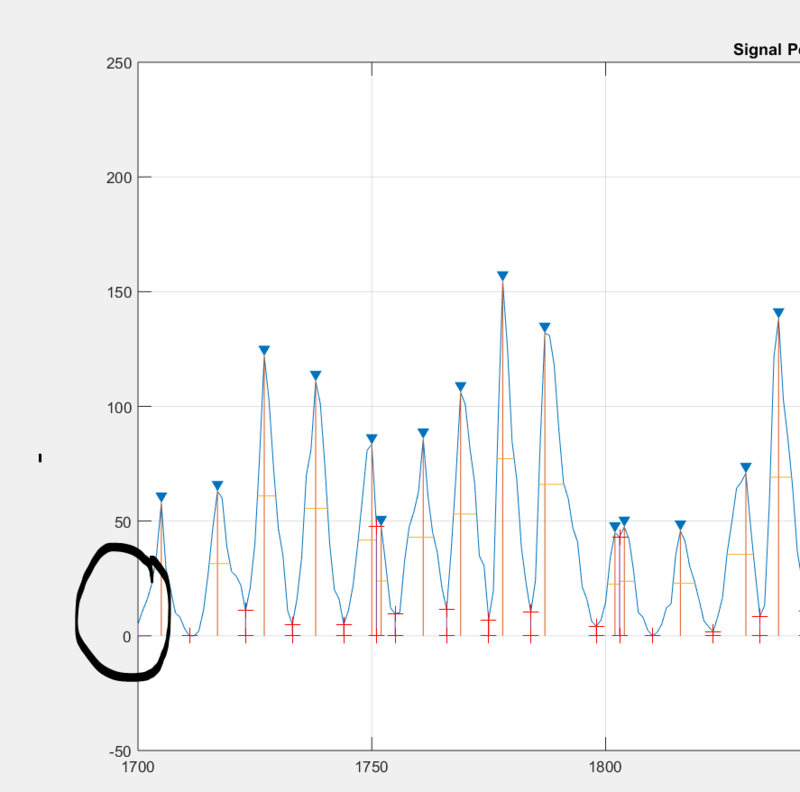 Yes, although inverting it and then using the original code means that the peaks are the previous borders, and the borders are the previous peaks. It’s not really that complicated. It’s just different. Looks complicated to me. As border is a line beside peaks. Is not directly opposite/reflect on peak. Do you look at the findpeaks.m and analysis it? I did not look at the findpeaks code. I have no desire to, since it is obvious that the 'borders’ are simply the ‘peaks’ of the negated (inverted) signal. Thanks a lot. I am much appreciated. I am not sure I am correctly checking this. It seemed like missing the first border. 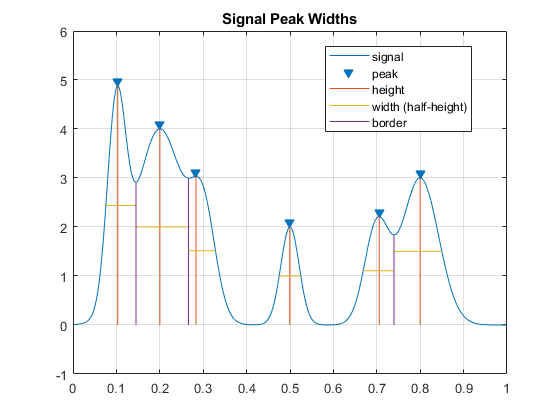 The ends of a signal are not ‘peaks’ (or ‘valleys’) because there is nothing on the other sides of them to define them as such. This is the expected behaviour of findpeaks. 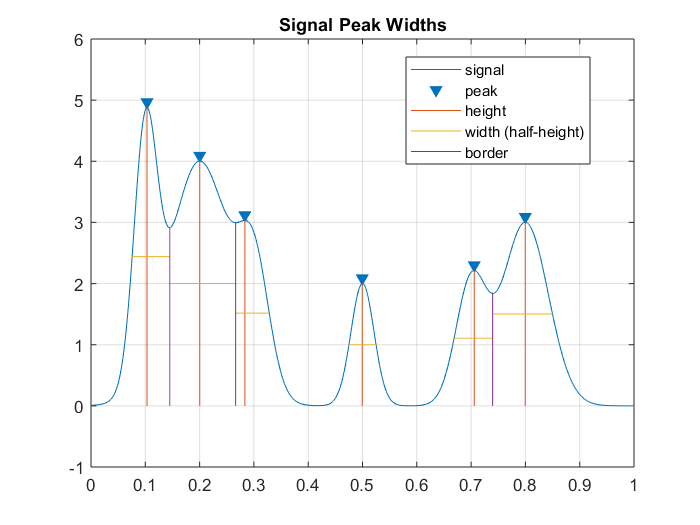 Note that the other end of the signal is also not identified as either a ‘peak’ or a ‘valley’. Thanks! I am appreciate it. Let say I want to plot the first peak (range from 1700 to 1711), it turn out to be a full range of "pks" and "locs" value. I am not sure can I plot only specific range and then find the pks in that specific range? Maybe I should change the code in ploting in a specific range, but i run out of idea. That should work (I did not test it). Is that mean PeakSig find the points of "locs" at 3rd point? which is the first peak answer. 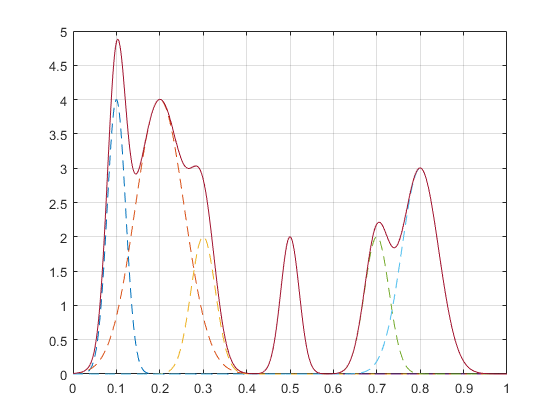 However, how can I plot of first segment of the peak? Make a copy of findpeaks.m and call it findpeaksandborders() in some utilities folder on your path with all your other m-files. BE SURE NOT TO ALTER THE ORIGINAL ONE!!! Then have findpeaksandborders() return the borders (iLB and iRB) in the list of output arguments. Yes, I also thinking of the boders appear in built in function of "findpeaks". And make a copy of findpeaks.m. So I have "findpeaksandborders.m" and "findpeaks.m" in my "C:\Program Files\MATLAB\R2017b\toolbox\signal\signal" folder. However, I do not understand what should I change in "findpeaksandborders.m" file to get have findpeaksandborders() return the borders (iLB and iRB) in the list of output arguments. Then when youi call findpeaksandborders() just make sure you accept all 6 returned variables. After I edit my findpeaksandborders.m file by adding in the global value (following your steps), I can now use/call my findpeaksandborders() function. 2. I am still figuring out why I am unable to edit (Access is denied). Maybe I am using university matlab licence PC. You're not allowed to change anything under Program Files. That's a Windows rule. You'll have to save a copy of the m-file where you have the rest of your m-files, and edit it there. Thanks. I tried edit the "findpeaksandborders.m" in my matlab directory (not in matlab file under Program File) following your suggestion. In your words "make sure you accept all 6 returned variables". Any idea which part should I check? Looks like you got it working since you've accepted an answer. However, it cannot find the first border. I think it is due to invert of peak.